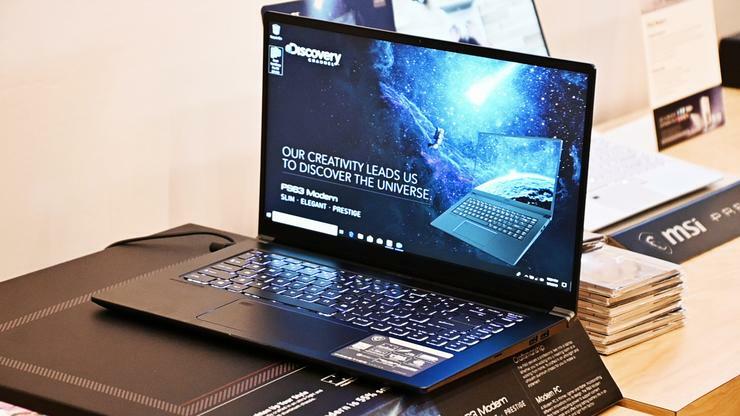 Alongside their new lighter, thinner 17-inch gaming laptop, MSI also debuted a new notebook for content creators at this year's CES: the MSI PS63 Modern. "When cutting-edge technology meets an exploratory spirit; a great creation is born." says Derek Chen, MSI NB Marketing Leader. "The PS63 represents boundless exploration, inspiration, and creativity. Under the shared values of exploratory minds and creative powers, MSI has collaborated with Discovery Channel, the global leader in inspirational and creative contents." Weighing in at 1.65kg, the MSI PS63 Modern features a 15.6-inch FHD IPS display with thin bezels and 100% sRGB color. Under the hood, the PS63 Modern comes equipped with combo storage, up to 32GB of DDR4 RAM, Nvidia GTX 1050 graphics, Cooler Boost 3 plus a fingerprint sensor. The usual plethora of ports are also present and accounted for. The MSI PS63 boasts two USB 3.1 Gen 1 ports, a matching set of USB 3.1 Gen 2 and USB Type-C ports, MicroSD slot, HDMI out plus microphone and headphone jacks. Pricing for the PS63 has yet to be confirmed but MSI tell us it will be coming to Australia later in the year.